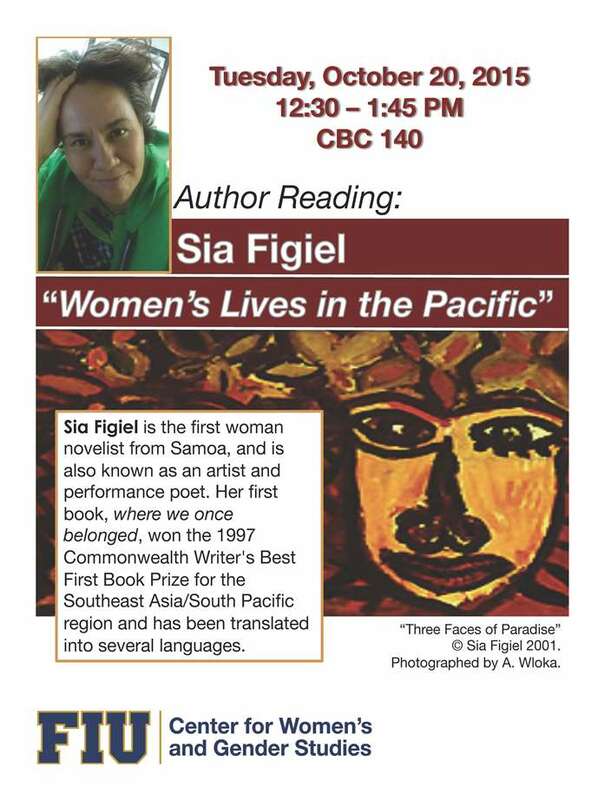 Indigenous Author Reading: "Women's Lives in the Pacific" by Sia Figiel. Tuesday, October 20. CBC 140. 12:30 - 1:45. Sia Figiel an Indigenous Samoan novelist, performance poet, and artist. Everyone is welcome to hear Sia Figiel a guest speaker for the course “Global Women’s Writing: Gendered Experiences Across Societies and Cultures” taught by Dr. Michaela Moura-Koçoglu. Her 1999 book "Where We onced Belong," is a bestseller in New Zealand and winner of the prestigious Commonwealth Prize. Sia Figiel’s novel marks the first time a novel by a Samoan woman has been published in the United States. Lively, spirited, and fiercely written, Figiel uses the traditional Samoan storytelling form of su’ifefiloi to talk back to Western anthropological studies on Samoan women and culture. In doing so, she weaves an honest – and sometimes brutal – coming-of-age story which combines poetry with an exhilarating combination of humor and violence. Sponsored by the FIU Center for Women’s and Gender Studies.